Making cheese involves many steps, but essentially it is simply the process of turning a liquid into a solid. Rennet plays an important role in making this happen. 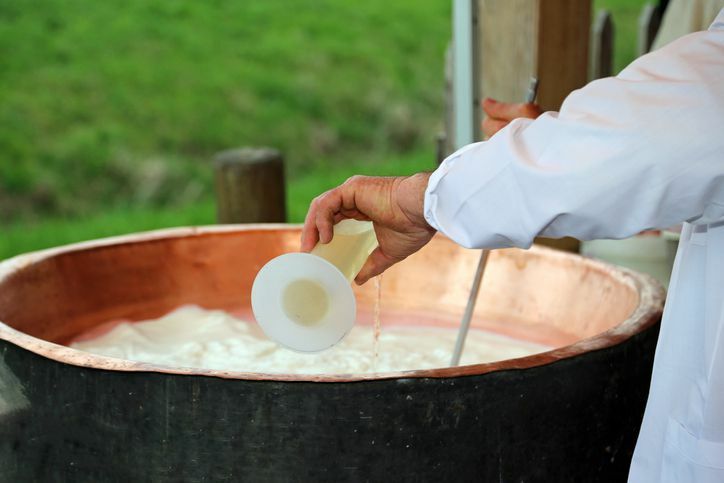 Rennet is used to coagulate, or thicken, milk during the cheesemaking process. Chymosin (also called rennin) is the enzyme used to produce rennet. After the milk is collected, the cheesemaking process begins by adding starter cultures that change lactose (milk sugar) into lactic acid. This process changes the acidity level of the milk and starts the process of thickening the milk into a solid. Next, rennet is added to encourage even more thickening so that curds form and separate from the whey (liquid). Rennet is derived from one of the four sources below. However, the U.S. Food and Drug Administration (FDA) does not require cheesemakers to specify what type of rennet they use. The enzyme chymosin is found in the stomach lining of animals because it aids in the digestion of their mother's milk. Rennet made from animal chymosin is usually called “traditional rennet” on cheese labels; as noted above, however, cheesemakers are not required to specify what type of rennet they use. Animals are not slaughtered just so cheesemakers can produce rennet. Rather, these animals are sold for meat and as a way of using the whole animal, stomach enzymes are also extracted for the production of rennet. Animal rennet does not directly affect the flavor of cheese. Plant-based rennet is derived from cardoon thistle, artichoke, nettles, and other plants. The plants are soaked in water to extract a thickening enzyme similar to chymosin. Plant-based rennet can be challenging to work with for two reasons. One, the strength of plant rennet isn't always consistent. Knowing how much to add during the cheesemaking process to properly coagulate the milk can be difficult. Two, plant rennet affects the flavor of cheese. This can be a positive thing. Many types of cheese from Portugal are made using thistle rennet, which gives the cheese a distinct and unique flavor. Some examples are Torta del Casar, Azeitao, Serra da Estrela, and Serena. However, thistle rennet can also give cheese an unpleasant vegetal or bitter flavor, which is a reason some cheesemakers avoid it. Many cheesemakers who use plant-based rennet will specify this on the label, although they are not required to. If it's not on the label, a knowledgeable cheesemonger will often know if a cheese is made with vegetable rennet. Ask at your local cheese shop or check out this partial list of cheeses made with vegetarian rennet. Increased worldwide demand for traditional animal rennet led to the production of another type of rennet, one that worked as well as animal rennet but could be made in a laboratory. Chymosin chromosomes are extracted from an animal's stomach cells then implanted into yeast cultures that act as a host. The host culture encourages the growth of new chymosin enzymes. The new chymosin enzymes are separated out and purified. Although genetically engineered/fermentation produced rennet originates from the cell of an animal, it is considered to be its own thing, a new generation of enzymes if you will. Therefore, it is considered to be vegetarian-friendly. However, vegans and vegetarians must decide for themselves if they will consume this type of rennet. Avoiding it might not be easy; this type of cost-effective and reliable rennet is widely used in cheesemaking. Some molds have enzymes that are similar to chymosin. These enzymes are extracted in a lab to make microbial rennet. Microbial rennet is not widely used because it can make the cheesemaking process more difficult and give cheese a bitter flavor. Traditional animal rennet and genetically engineered rennet usually yields consistent results; microbial rennet does not. Not just hard cheeses have rennet in them. Most types of soft cheese and fresh cheeses are made using rennet as well. There are some exceptions, however, such as ricotta and quark, which usually do not contain rennet. You can also make several types of cheese at home thickened with acid instead of rennet.